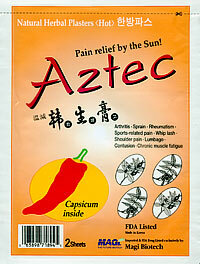 Korean analgesic plasters come in two types: cooling (called Cool Running) and warming (called Aztec). 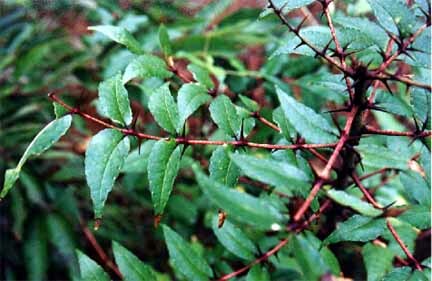 Both plasters rely on a basic set of ingredients: phellodendron bark, zanthoxylum fruit, gardenia fruit, methyl salicylate (wintergreen leaf oil active component), and glycyrrhizic acid (one of the active components of licorice root). The Cool Running formulation incorporates menthol to produce a cooling sensation, while the Aztec formulation incorporates capsicum (chili pepper), one of the most popular topical analgesics currently in use. These are products of Sang-A Pharmaceutical Company Limited in Seoul Korea. The company's main product is Zenol (pictured below, right), a product similar to the cooling plaster described here, but designed for the Korean market. Sang-A Pharmaceuticals has developed advanced technologies for topical applications, and produces, in addition to plasters, skin creams and lip protector; it has sales of nearly $50 million (U.S.) per year in Korea and over 400 employees. The Cool Running and Aztec plasters are imported by Magi Biotech, which is affiliated with Dong Bang USA; these two companies were founded in 1982 in Southern California (Santa Fe Springs). They specialize in offering supplies for acupuncturists and endeavor to bring together traditional acupuncture with modern scientific research and technology, engendering innovation for this ancient art. After working several years on matters of formulation, quality control, and labeling, the importers were able to gain approval by FDA for the plasters. 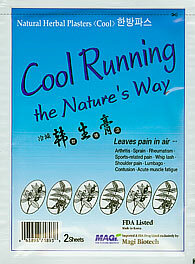 The packets of Cool Running and Aztec include 2 plasters each, with a foil zip-lock container for the herb infused sheets to protect their active components, and separate adhesive tapes that go over the plasters and have a margin of light sticky gum so that the only part adhering to the skin is the edges. The plaster is useful for 6-8 hours, so that the two plasters can be used in one day. 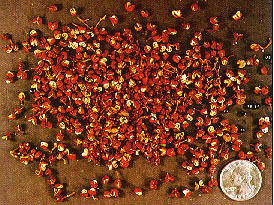 Zanthoxylum (left) is the source of the well-known Szechuan pepper (right) used in spicy Chinese dishes. This pepper immediately produces a tingling sensation on the tongue, a reflection of the potent effects of the active component sanshool. In addition, the fruit contains many essential oils that penetrate the skin and improve circulation.